The President, Shri Pranab Mukherjee at the inaugural function of the centenary celebrations of Osmania University, in Hyderabad on April 26, 2017. The Governor of Telangana, Shri E.S.L. 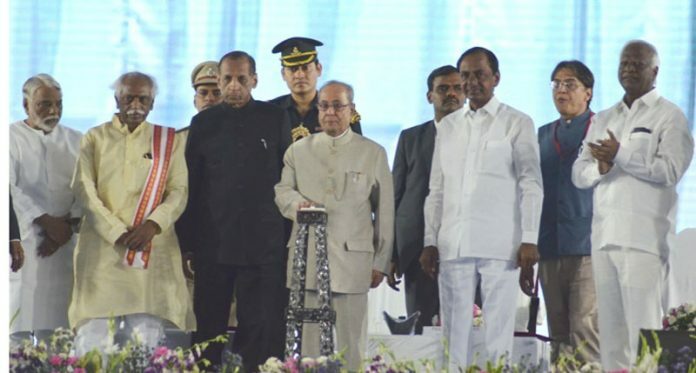 Narasimhan, the Chief Minister of Telangana, Shri K. Chandrasekhar Rao and the Minister of State for Labour and Employment (Independent Charge), Shri Bandaru Dattatreya are also seen. Hyderabad: The President of India, Shri Pranab Mukherjee addressed the first convocation of the English and Foreign Languages University, Hyderabad in Hyderabad today (April 26, 2017). Speaking on the occasion, the President said on the august occasion of the first convocation of the English and Foreign Languages University, as we celebrate the impressive achievements of this University, he wanted to share with them some enduring reflections that ought to guide us in advancing our vision of education. He stated that to his mind, knowledge must pave the path of life; and living must essentially encompass pursue the path of learning. From times immemorial the continent of Asia, and South East Asia in particular, opened up novel paths of learning. Wherever the Buddha traversed – seeds of knowledge sprouted and flourished. Nalanda, after Takshashila, held the beacon of light very high for over a millennium across lands and seas and welcomed drifting seekers of knowledge and provided them a lasting resting place. The President said that today sustaining and reinvigorating higher education, in India as well as in other parts of the world, has become a major challenge, especially so in public institutions. Challenges exist for such institutions, both from outside and inside. Atleast four distinct factors impinge from outside as well as inside on the administration of an institution of higher learning. According to him, these are a) escalation of costs of learning; b) narrow pragmatics, i.e. market-oriented fast-track skill acquisition, as the sole goal of learning; c) the allure of invasive dominant communication systems depleting attention span; and d) corrosion of trust. He stressed that any attempt to build or re-orient higher education in such a situation requires administrative acumen. Administrative strength and sensitivity removes hurdles in the path of learning, and allows academics to thrive, as this University has displayed.